Those of you that live here have experienced it (I'm talking to you). It's horrible and seems to just be getting worse. Today was Three-Dollar Tuesday at the San Diego Fair, aka the Del Mar Fair; I shot this shot as I felt like shooting myself repeatedly on the way home from work. Updated: WC Varones goes Chinese. Dude, I was on my bicycle on 101. I passed hundreds if not thousands of cars, and I made it home waaaay before friends who tried to cover the same distance in a car. I was planning to drive to work tomorrow, but with traffic like this, I think I'll bike again! 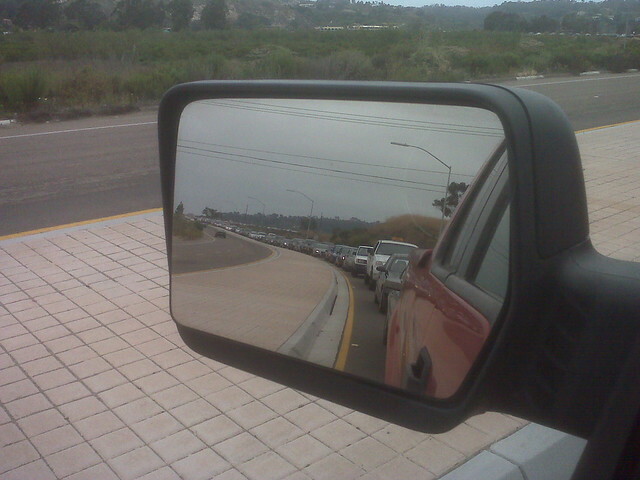 I'll tell you, WC, I was half tempted to park the truck and just walk to Carlsbad, I would have made if faster.